A group of independent reviewers has found definite progress on implementing the landmark 2007 Development Agenda Recommendations at the World Intellectual Property Organization. But the UN agency needs to elevate the debate, tie in with UN development agencies, create reporting mechanisms, make projects more compatible with local development levels, and detail use of financial and human resources, the reviewers found. The World Intellectual Property Organization’s main aim, as stated in its convention, is the promotion of the protection of intellectual property. However, WIPO is also a United Nations agency with a development agenda. The review also calls for better reporting on the utilisation of financial and human resources related to the development agenda projects, and for the establishment of a reporting mechanisms on best practices from successfully implemented projects and activities. The Development Agenda has created high expectations, some of which are not fulfilled, the review found. The Independent Review [pdf] of the Implementation of the Development Agenda Recommendations, dated 28 July, was published by WIPO on 18 August. It is unclear if it has been circulated to member states. The WIPO Development Agenda was adopted by the 2007 WIPO General Assembly with a set of 45 recommendations. At the same time the Committee on Development and Intellectual Property (CDIP) was established with a view to develop a work programme for the implementation of the 45 recommendations, and assess them. The 2010 General Assembly requested the CDIP to undertake an independent review of the Development Agenda (DA). The terms of reference of the independent review were agreed at the 14th session of the CDIP in November 2014 (IPW, WIPO, 18 November 2015), and three experts were subsequently appointed by WIPO. They were: V.K. Gupta, formerly senior advisor and director of the Traditional Knowledge Digital Library (TKDL), Council of Scientific and Industrial Research, India; Pedro Roffe, a long-time IP and development expert; and Gift Huggins Sibanda, former director general of the African Regional Intellectual Property Organization (ARIPO) (IPW, WIPO, 26 August 2015). In addition, some 372 people responded to survey sent to stakeholders. As reflected in many CDIP meetings, and underlined in the review, there is between member states a divergence of views on the manner in which the Development Agenda Recommendations are implemented. Developed countries generally consider that in the CDIP, implementation of the Recommendations is best served through projects and activities, while developing countries are seeking a broader approach and would like to include discussions about the relationship between IP protection and development. But there is “a general understanding that as the DA was developed through negotiations, as such it is understood to be a compromise. But it has evolved as a way of conciliating different perceptions, all geared towards promoting the development and protection of IP as an important contributor to the growth of countries,” the review said. “As the nature and political sensitivity of the issues were governed by divergent positions, the Review Team thus focused on reviewing the work done by WIPO, while taking note of the surrounding debate,” it said. The Review Team provided 15 findings articulated in 14 conclusions, and 12 recommendations. Many of the conclusions offered praise for the implementation of the recommendations. According to the review, WIPO took important and effective measures to “translate the political agreement on the DA into a work program for the Organization,” and that led to institutional reforms and exploration of new areas to the benefit of member states. The lack of coordination between Geneva-based diplomats and national authorities and the absence of awareness-raising activities about the importance of the DA led to a situation where Geneva-based discussion on the DA and its projects did not translate into concrete actions at the national level, the authors said. According to the review, “existing reporting mechanisms lack specificity particularly, on actual utilization of personnel and non-personnel costs.” Feedback and reporting mechanisms on actual utilisation of personal costs is also absent, the review said. The reviewers also called the CDIP to consider how best to respond to evolving circumstances and to the emerging development challenges being faced by the IP system; and to involve other UN development agencies to benefit from their expertise. WIPO member states are encouraged by the Review to enhance coordination between Geneva-based missions and their IP offices and other authorities in capital to reach a coordinated approach in dealing with the CDIP and raise awareness about the benefits of the DA. Higher level participation of national based experts should be enhanced, said the Review. The Review also said member states should formulate new project proposals for the consideration of the CDIP and should consider the establishment of a reporting mechanism on the lessons learned and best practices from successfully implemented DA projects. It also called for a periodic review of the sustainability and impact of projects, and for a database of lessons learned and best practices. It further called for consideration of linkage of the recommendations to WIPO Program and Budget Expected Results. New projects should consider the absorption capacity and the level of expertise of the beneficiaries, said the Review, and in the implementation of projects at the national level, WIPO should “explore close partnerships with UN agencies and other entities…” WIPO also “should pay more attention to recruiting experts that are very well versed and knowledgeable about the socio-economic conditions of the recipient countries,” it said. WIPO should include detailed information about the utilisation of financial and human resources related to the DA projects in its progress reports submitted to the CDIP, the reviewers said, adding that simultaneous assignment of the same project manager to multiple projects should be avoided. The Review calls for a mechanism to be put in place to report on the agreed recommendations contained in the evaluation reports and on the mainstreamed outcomes of the DA projects. The reviewers also said member states should take measures to resolve two CDIP outstanding issues concerning the mandate of the committee and the implementation of the Coordination Mechanism of the DA. Developing countries have requested that all WIPO committees report on their development activities to the WIPO General Assembly, according to their reading of the Coordination Mechanisms and Monitoring, Assessing and Reporting Modalities of the CDIP. 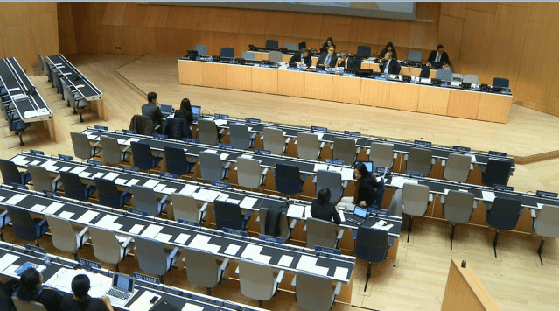 The Committee on WIPO Standards (CWS), and the Program and Budget Committee (PBC) do not presently report on their development activities to the WIPO General Assembly. The Review is expected to be considered by WIPO member states at the 18th session of the CDIP, from 31 October to 4 November. "Review Of WIPO Development Agenda Implementation: Good Progress But Expectations Unfulfilled" by Intellectual Property Watch is licensed under a Creative Commons Attribution-NonCommercial-ShareAlike 4.0 International License.